A few weeks ago, we reported that Paramount Pictures declined to pick up their options on two Terminator Genisys sequels, which had previously been set for release in 2017 and 2018, respectively. While this move certainly marks the end of Paramount's involvement, franchise star Arnold Schwarzenegger revealed that it is by no means the end of the franchise as a whole. Here's what the actor had to say during a new interview to promote his movie Aftermath, which debuts April 7. "I'm looking forward to doing another Terminator movie, yes. I don't want to call it, like, fake news, like the president calls it, but I think people just write things, I have no idea why. Just because Paramount doesn't want to pick up the Terminator franchise, you have 15 other studios willing to do it, that doesn't mean the Terminator franchise is finished, right? It just means they are on their way to negotiate with another studio, but I can't give you the details of that. They'll announce that. But, yes, the Terminator franchise is never finished. And remember that after 2018, James Cameron is getting it back, and then it will continue on!" The actor's mention of James Cameron in this Fandango interview is referencing the fact that the rights to the entire franchise revert back to James Cameron in 2019, 35 years after The Terminator hit theaters, but it isn't clear exactly what date the rights revert back to the filmmaker. Paramount had originally set those Termonator Genisys sequels for release in 2017 and 2018 so they could release them before the rights reverted back to James Cameron, but now that won't happen. Even if Paramount didn't pull the plug, the sequels would have faced an uphill battle, since star Emilia Clarke indicated she wouldn't return for the follow-up. When asked about James Cameron's involvement in the next Terminator movie, Arnold Schwarzenegger had this to say. "Cameron will be producing it, and there will be another director on it. I'm always looking forward to doing another Terminator, especially if the story is written well and it's really entertains the whole world." While we still have some time until the franchise reverts back to James Cameron, it seems the filmmaker is already making plans to take over the franchise. 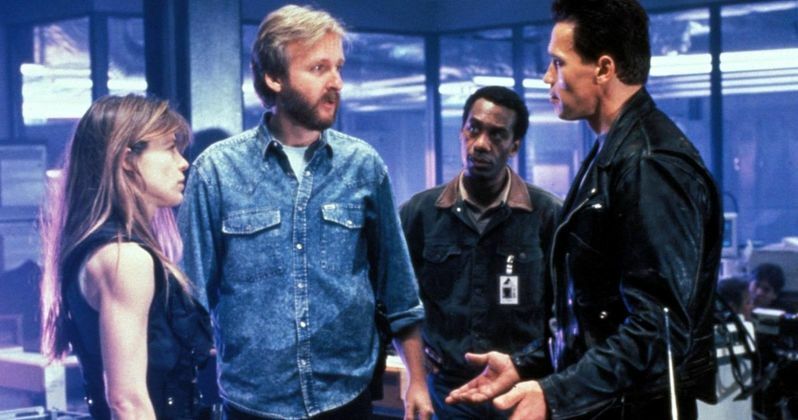 We reported in January that James Cameron is teaming up with David Ellison, who has the rights to the franchise, and Tim Miller, who is in early talks to direct this new Terminator movie, which is believed to either continue the story after James Cameron's 1991 classic Terminator 2: Judgment Day, or reboot the franchise as a whole. David Ellison is said to be funding an "exploratory effort" that will bring a number of sci-fi writers in to help craft the movie. David Ellison also teased a few weeks ago that there will be a big announcement regarding this franchise coming soon, so it's possible that they may have found a new studio home for the Terminator franchise already.